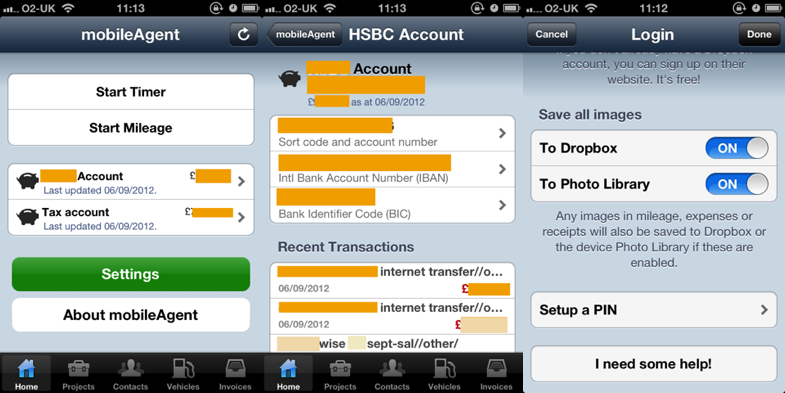 Today, I'm happy to announce that mobileAgent 1.9 is available in the AppStore. It has taken me a lot longer to finish this version than I was hoping or expecting, but in the end, I think it's a more stable, more useful version of the app. Bank Accounts now show the past 30 days of transactions. This is especially useful if you have the Barclays intergation with FreeAgent, as your transactions will be available to you on a daily basis. Otherwise, you still need to upload them. Any image attached to an Expense, Mileage or Receipt can now be saved to your Photo Library or uploaded to Dropbox, as well as being uploaded to FreeAgent. This means if you need to provide someone with a bulk dump of your receipt images, you can get to them easily. This doesn't effect the normal Add Receipt upload, which will still always go to Dropbox (if Dropbox is configured at all), but it's new for Expense and Mileage attachments. Add Receipt will upload to the Photo Library if its turned on. The new FreeAgent US accounts are now fully supported, as well as the UK accounts and the Universal account type. I've also fixed a number of small bugs and things which were bugging me and a number of users. It's also working and tested with the current beta of iOS6, so it should continue to work once iOS6 is released. mobileAgent gets a set of tokens (think username and password) which it can use to access your account. You can revoke the applications access if needed, but the application never sees your password. The steps are slightly different tho. 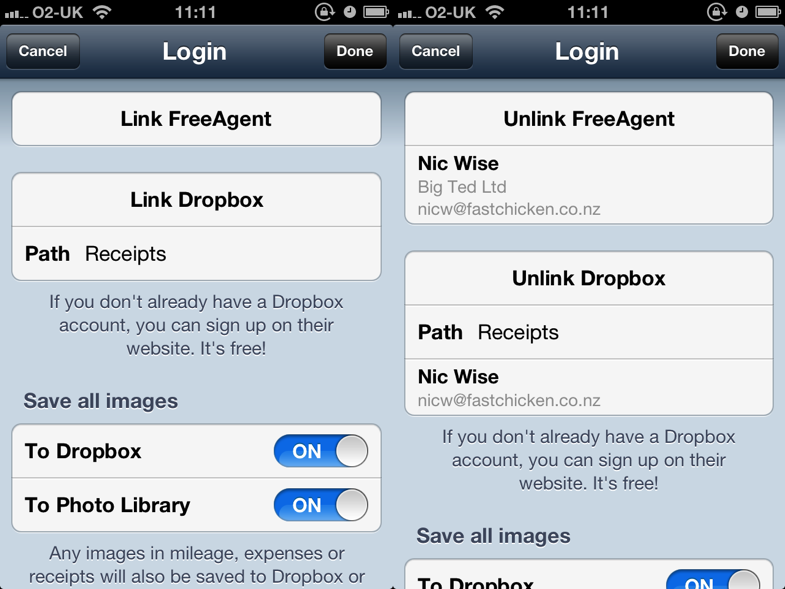 You "link" you device to your FreeAgent account, and your Dropbox account, and once that link is created, you are good to go. Note that if you use My Business Works or IRIS Openbooks, you are linking to FreeAgent like any other user - just enter the same username and password you would normally use to log into the website (My Business Works users may want to read this, if they have never used mobileAgent before). I'll change the wording in a future version to make it obvious that these are the same service. Here's an example of what the login screen looks like before and after the linking is done. So, if something isn't working for you after the upgrade, please get in touch. The support pages will be updated tomorrow with new info on logging in and other support-related stuff, but I'm happy to help if you are having issues.